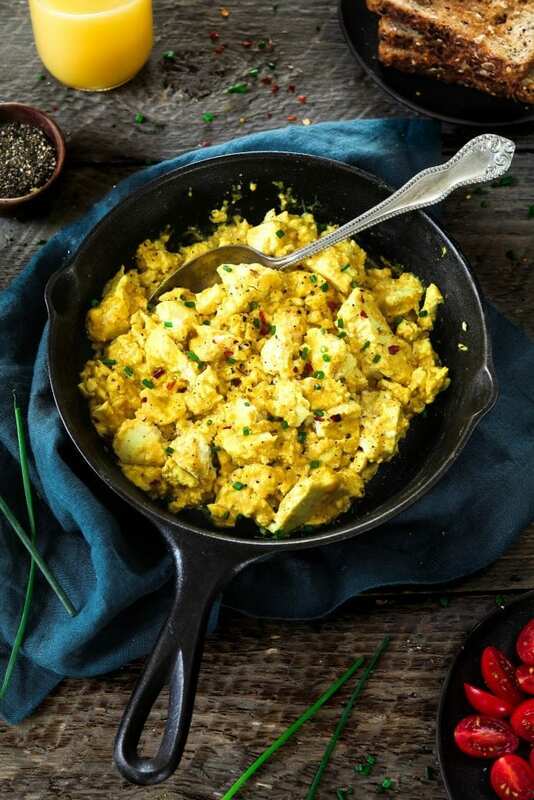 Reminiscent of a classic, this eggy-style Tofu Scramble Recipe is so easy to make and downright delicious! There are lots of ways to make a tofu scramble recipe and I’ll be sharing my faves in the future. But today, I want to share a very basic and classic-style recipe. I think you guys are going to love it! This recipe is reminiscent of my childhood favorite. Growing up, my mom made the best scrambled eggs for breakfast. They were fluffy, buttery and delicious! I’ve been making a tasty alternative for years with simple spices and a hint of vegan cream. Recently though, I was asked for a recipe that is closest to real eggs. I knew there wasn’t an exact replacement, but I decided to search for ideas to amp up my tofu scramble. I discovered this recipe by My Goodness Kitchen and I was curious to try it out. 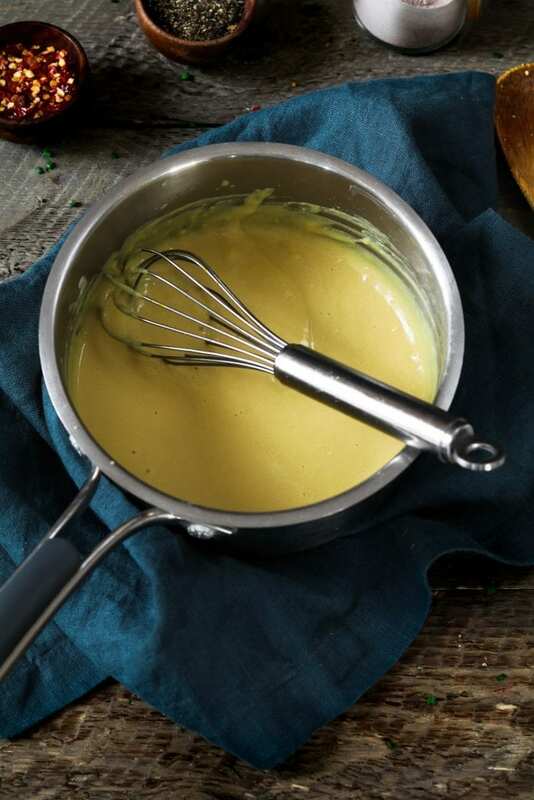 It’s made with a creamy sauce that melds everything together. I was pleasantly surprised at how close the texture was to scrambled eggs. It was really easy to make and only required a few extra steps than my own recipe. I made some adjustments because it was a little rich for my personal taste. What is Kala Namak (black salt)? It’s an Indian mineral salt that has a very distinct sulfurous smell and taste. It seems to intensify when heated up too. This will add an ‘eggy’ smell and flavor to your tofu scramble recipe. I highly recommend trying it at least once. It’s really easy to overdo, so remember that a little goes a long way. I use 1/2 teaspoon and use sea salt if I need more seasoning. If you’re not into ‘eggy’ flavor, you can just use sea salt instead. It will still be delicious! This is what makes the recipe stand out from others. It’s thick, creamy, slightly cheesy and rich in umami flavor. 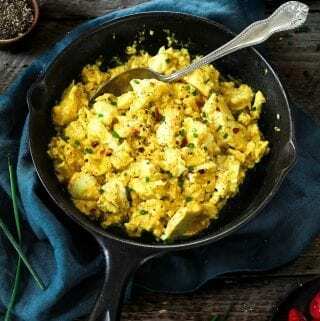 It will turn your ordinary tofu scramble into a fluffy, savory ‘eggy’ scramble. Add vegan butter to a medium saucepan (or pan) over medium heat. Once melted whisk in the flour. Keep whisking until combined and smooth. Slowly whisk in broth and milk. Keep whisking until smooth and thickened. About 2-3 minutes. Remove from heat and whisk in nutritional yeast, mustard, garlic powder, black salt, turmeric, paprika, cumin, and onion powder. Whisk until smooth. The consistency should be thick, but if it’s too thick for your taste, you can whisk in a few splashes of non-dairy milk. Heat oil in a med-large skillet over medium heat. Once hot, add tofu and lightly sear and brown the edges. About 3-5 minutes. Now sprinkle tofu with sea salt and pepper. Let the tofu sit before moving the pieces around the pan so it has time to brown. Be gentle when stirring so the tofu doesn’t break up too much. Otherwise, it will get too mushy when you add the sauce. Whisk the sauce once more if needed, then add it to the tofu and gently fold until just combined. Cook for 1-2 minutes and remove from heat. Taste for seasoning and add if needed. Top with fresh-cut chives, black pepper and, red pepper flakes if desired. 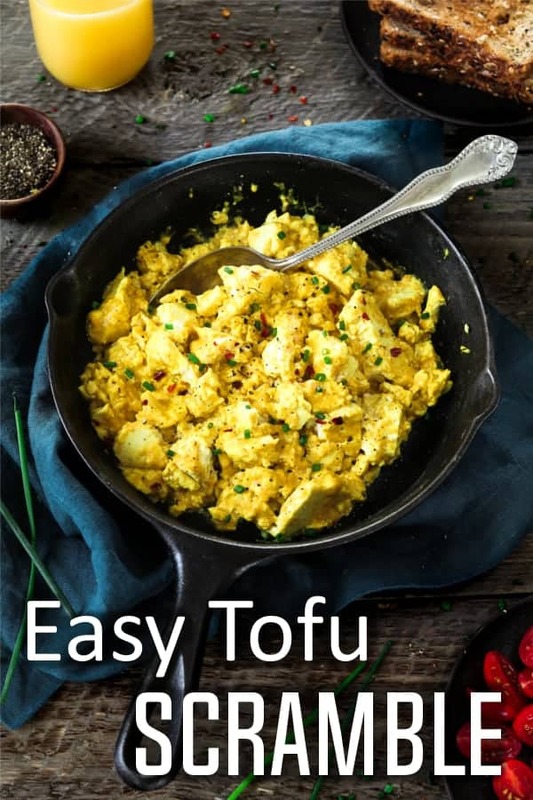 If you make this Easy Tofu Scramble Recipe, let me know what you think by ★ star rating it and leaving a comment below. It would really make my day. You can also follow me on Instagram and share your creation with me. Just tag me @veganhuggs and hashtag #veganhuggs so I don’t miss it. Add butter to a medium saucepan (or pan) over medium heat. Once melted whisk in the flour. Keep whisking until combined and smooth. Slowly whisk in broth and milk. Keep whisking until smooth and thickened. About 2-3 minutes. Heat oil in a med-large skillet over medium heat. Once hot, add chunks of tofu and lightly sear and brown the edges. About 3-5 minutes. Now sprinkle tofu with the 1/2 teaspoon of sea salt and cracked pepper to taste. * Let the tofu sit before moving the pieces around the pan so it has time to brown. Be gentle when stirring so the tofu doesn't break up too much. Otherwise, it will get too mushy when you add the sauce. Whisk the sauce once more if needed, then add it to the tofu and gently fold until just combined. Cook for 1-2 minutes and remove from heat. Taste for seasoning and add if needed. * Top with fresh-cut chives, black pepper and, red pepper flakes if desired. Enjoy! 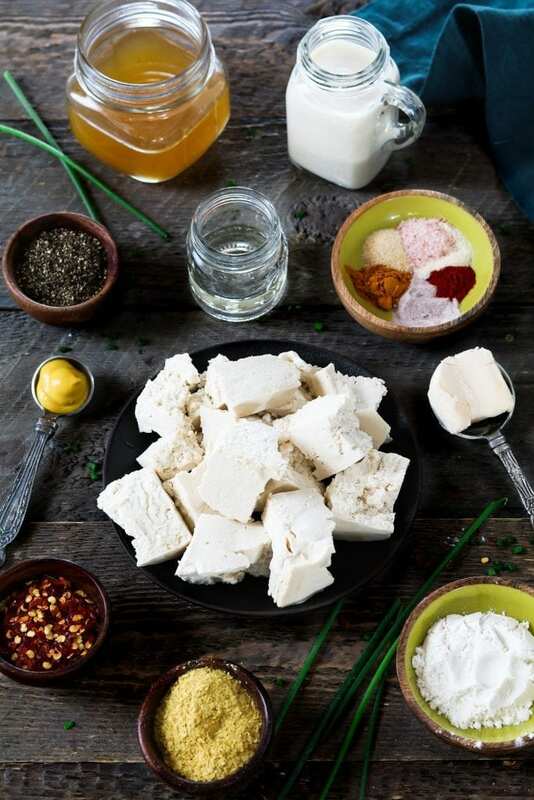 * Pressing Tofu: place a block of tofu on a paper towel-lined plate, and wrap tofu in a few paper towels. Add another plate on top of tofu, and add a few cans of food on top or a heavy book. Let it drain for 15 minutes. 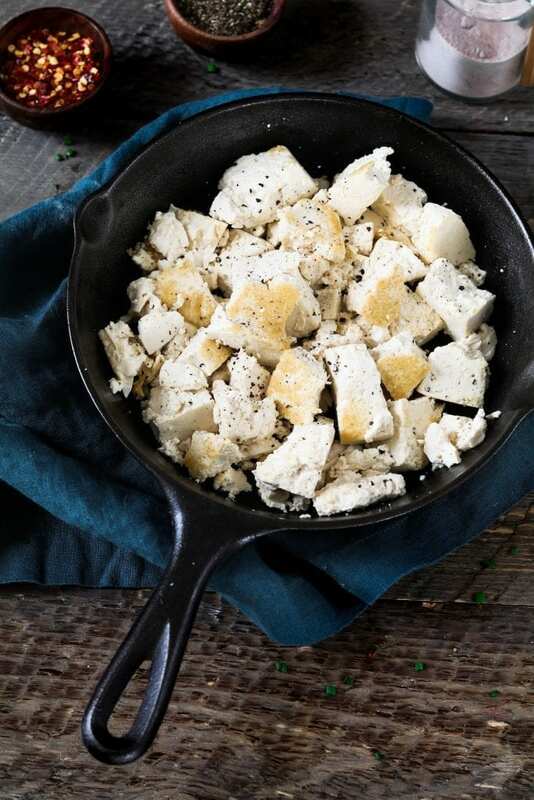 * The black salt adds an 'eggy' smell and flavor to your tofu scramble recipe. I highly recommend trying it at least once. It's really easy to overdo, so remember that a little goes a long way. I use 1/2 teaspoon and use sea salt if I need more seasoning. If you're not into 'eggy' flavor, you can just use sea salt instead. It will still be delicious! The texture was phenomenal! The taste was a bit salty for me. I’m on a salt free no oil plant-based plan. I think the Nooch was too much. I will adjust the seasonings and try this again.. it’s truly an amazing texture blend just like soft scrambled eggs. Thanks! Making a recipe always seems so easy, but when you start as an amateur (myself) you have to take a good look at what you do. Despite the fact that sometimes a little too much or too little of the ingredients go in, the dishes are fine to eat! This is hands down the best tofu scramble I’ve ever had. I make this almost ever day and have shared the recipe with all my vegan friends. So good!! I just made this today and it was incredible! The best scrambled tofu I’ve ever had. My husband and 2 year old loved it as well. I would recommend this to anyone craving scrambled eggs without the eggs. Would this be suitable for freezing?